Piano music by Grieg and Piazzolla will be played by David Hammond. 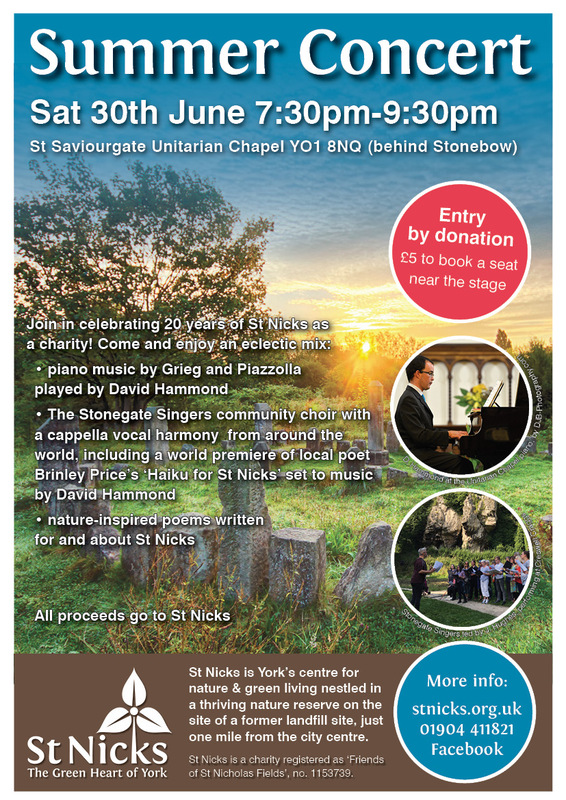 York based community choir The Stonegate Singers will perform songs from around the world and premiere David Hammond’s choral arrangement of ‘Haiku for St Nicks’ written by local poet Brinley Price. Accompanied by David on piano, York Guildhall Orchestra cellist Sarah Sigsworth will be playing ‘Requiebros’ by Cassadó and ‘Elegie’ from Rachmaninov‘s Morceaux de fantasie arranged for cello and piano. Local poet Brinley Price will read his nature inspired poems written for and about St Nicks. If you can, please help spread the word about the event by sharing/displaying this poster. Thank you! All proceeds go to St Nicks charity; light refreshments will be available. Entry: Pay As You Feel Donation on the door/ £5 to reserve a seat near the stage – please use the form below or send a cheque made out to ‘Friends of St Nicholas Fields’ to our address. David Hammond (piano): David studied music and piano, with Liz Haddon, at the University of York, and has worked as a musician in York for twelve years. 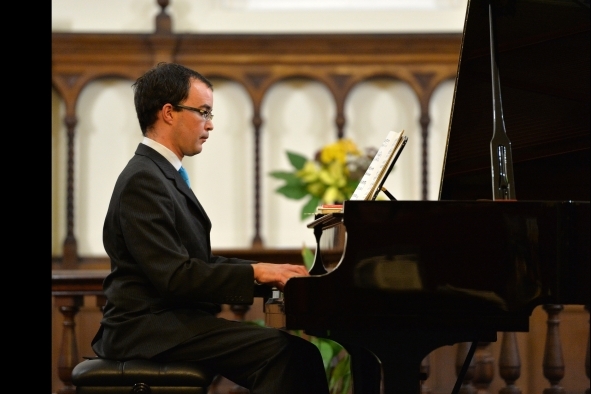 He has been a piano accompanist to many groups and soloists, and also worked as a community musician. He regularly performs in the York area, including in Castle Howard, and you may have spotted him in his other role as a recycling officer for St Nicks. David has also been involved in Indonesian Gamelan music since 1999, and co-runs York Community Gamelan, a group open to all. 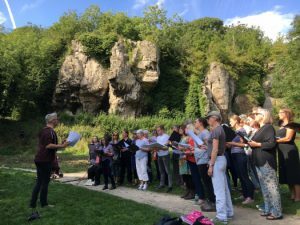 The Stonegate Singers is a community choir directed and founded by local composer and researcher Jon Hughes. They’ll be singing a diverse selection of a cappella vocal harmony drawn from traditions around the world, including songs from Africa, Croatia, Ireland and North America. The Stonegate Singers is open for anyone to join, and the music is taught by ear, one part at a time. That way, both people new to singing and people with more experience can work together. For thousands of years, all over the world, and in many different cultural contexts, people have sung to express joy and grief, to aid healing, to accompany work, devotion, and the rituals of life: singing has been a part of life, a way of binding people together and creating communities. 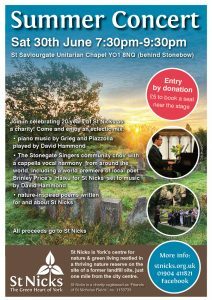 The Stonegate Singers hope to bring some of this community feel to the Unitarian Chapel on 30th June! Sarah Sigsworth (cello): Sarah learns with Sue Lowe and enjoys playing with local orchestras such as York Guildhall Orchestra. She is also a Project Assistant at St Nicks. 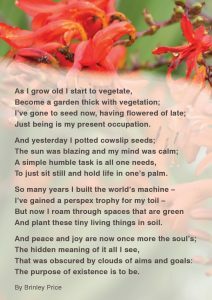 A beautiful poem written by a member of our creative writing ecotherapy group on how nature improves wellbeing. Brinley Price (poet): Brinley is a retired creative writing teacher who taught other mental health service users. 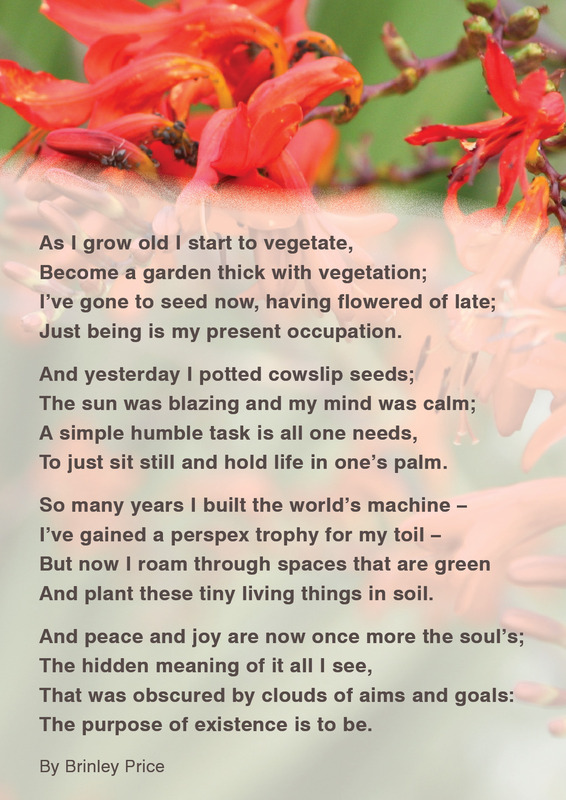 Now he takes part in several of our Ecotherapy groups, and has written a number of poems inspired by activities at St Nicks and the nature reserve, including this one.